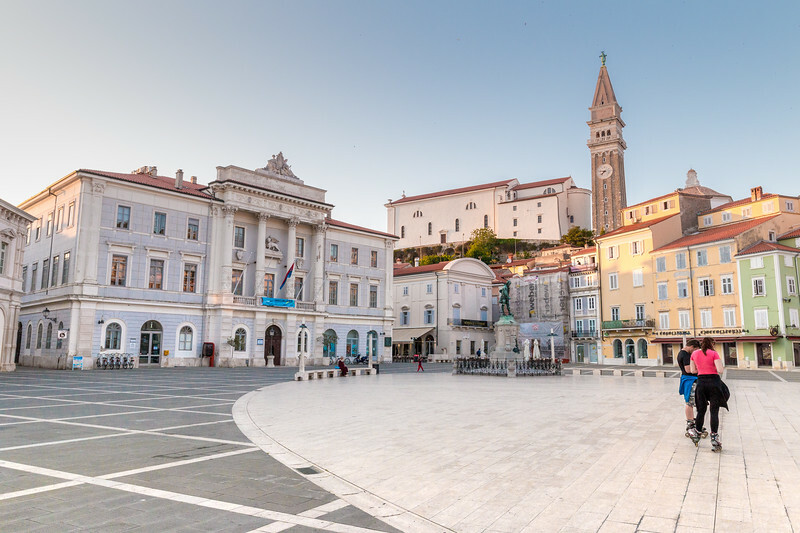 The Adriatic may not often be associated with Slovenia yet one of the region’s most charming towns lies on the country’s small stretch of coastline. 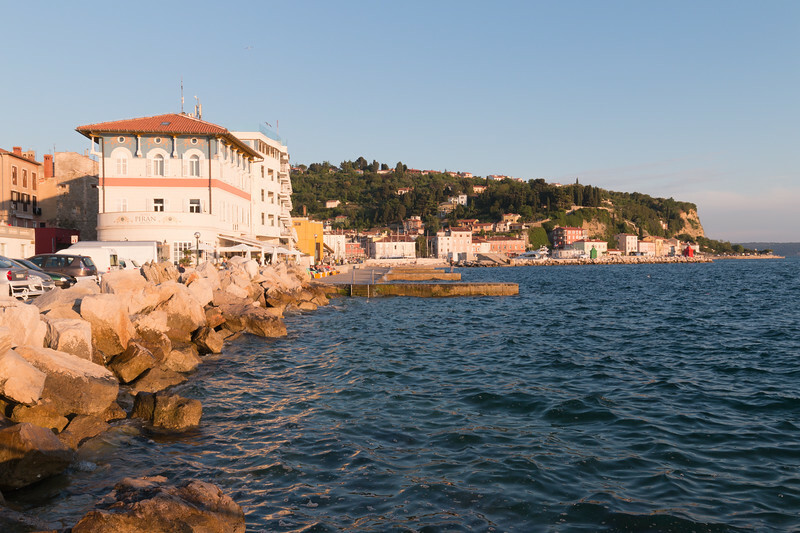 Welcome to our quick guide to Piran! Piran is a unique town in Slovenia and one with a completely different character. This coastal town located on a small peninsula has an Italian feel to it due to the Venetian-style architecture of its old town, which comes from the times when it was part of the Republic of Venice, between the 13th and 18th century, and, more recently, Italy, from 1918 til 1947. Locally, the Slovenian language sounds slightly Italian. 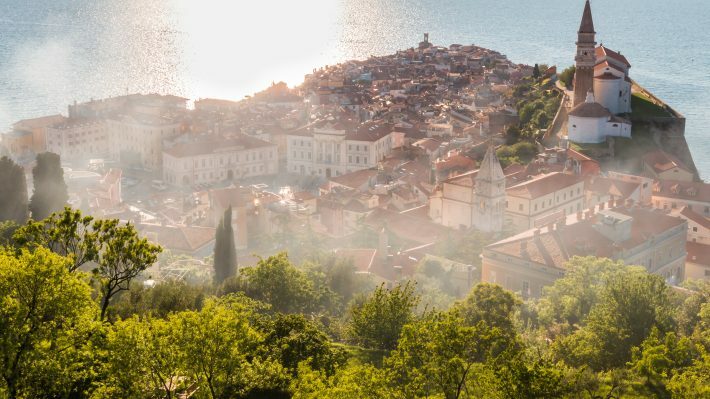 Squares, narrow streets and alleyways, towers and even a wall with great views, all of which can easily be explored on foot, make Piran a must-stop on any trip to Slovenia. And in typical coastal style, you can have great seafood and hang at one of the cafés. 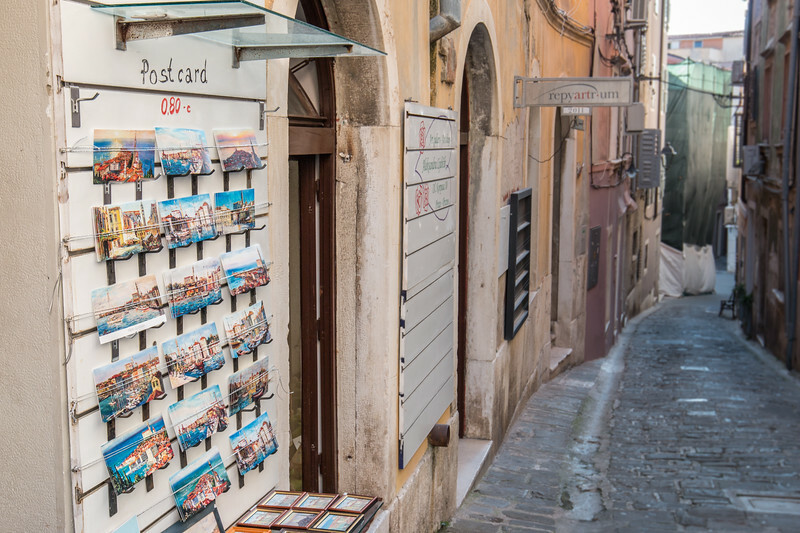 Piran is quite small and the only way to explore its old town is on foot. If you only want to quickly breeze through it, an hour or two are enough to walk from one end to the other. Realistically, we recommend staying a bit longer, at least half a day, if you want to get to know more of Piran and witness the beautiful colors of the city at sunset. 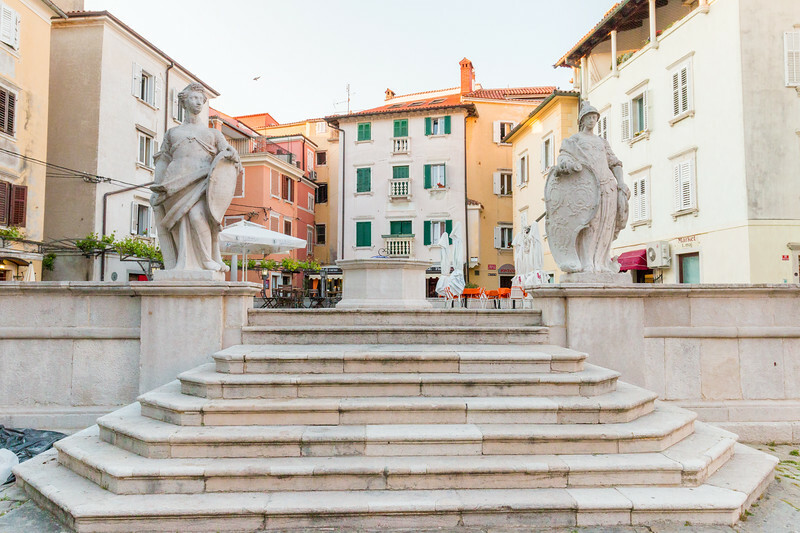 The essence of the old town consists of narrow streets with the heart at the fairly large marble-floored Tartini Square (Tartinijev Trg) – named after the local Violinist Giuseppe Tartini. This is where the most impressive and finest buildings are located, plus you can always see the beautiful bell tower in the background. Highlights include the 15th-century Venetian house and the Town Hall. Another place worth mentioning is the First of May Square (Trg 1 Maja), that once was Piran’s central square. It can be reached by going through a maze of narrow streets and alleyways flanked with interesting old buildings. The best way to explore the old town is really by getting lost in it and discover captivating things around every corner. 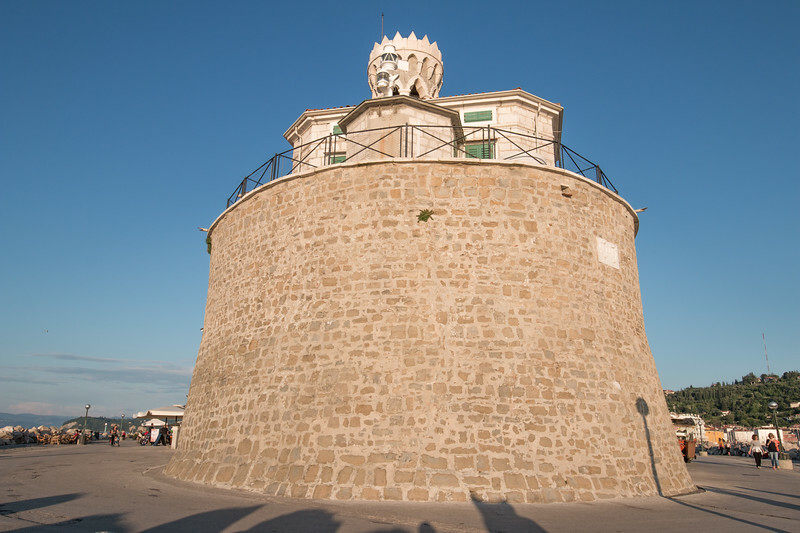 The best views in Piran are definitely from the old town walls that overlook the peninsula. A moderately steep cobbled street connects Tartini Square to the entrance where you can climb the wall and its towers. The street name is Ulica IX. Korpusa. 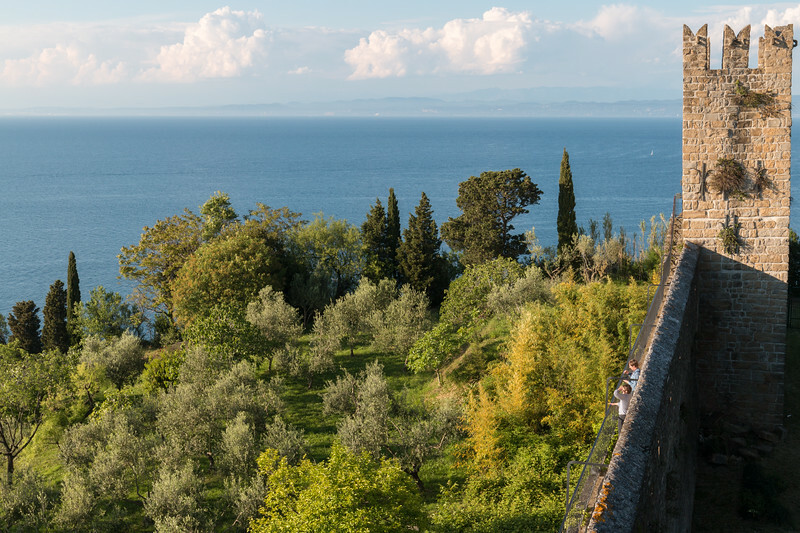 Construction began in the 7th century and although the majority of the walls are now gone, the main section that still exists is in really good shape and is definitely a must-visit place in Piran. We hung around for quite a while admiring the view and waiting for the sun to set. Perched atop of a hill above Tartini square is the Cathedral of Saint George, the patron of Piran. 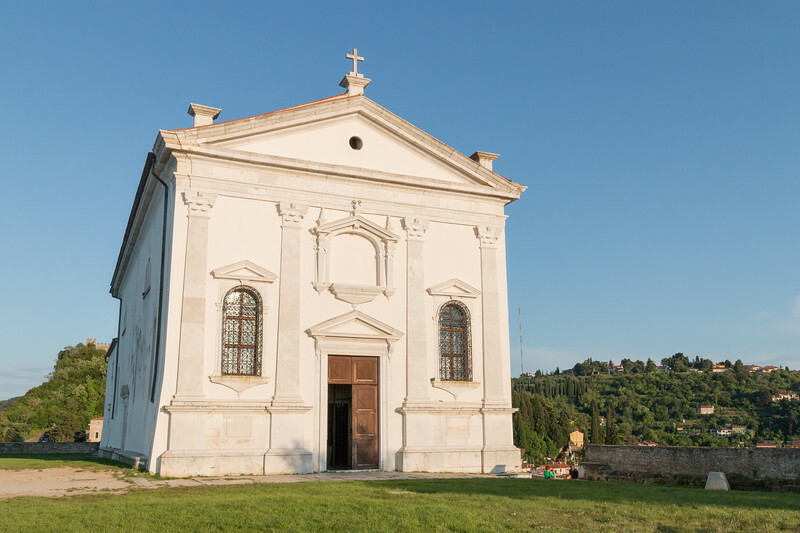 The cathedral’s complex also includes the famous bell tower, the baptistery, and a museum. While the door of the cathedral is usually open, you can only see the interiors behind a metal grille. From the Cathedral there are really beautiful views over to the compact center of Piran and the Adriatic, but for even better ones, the bell tower is the place to go. 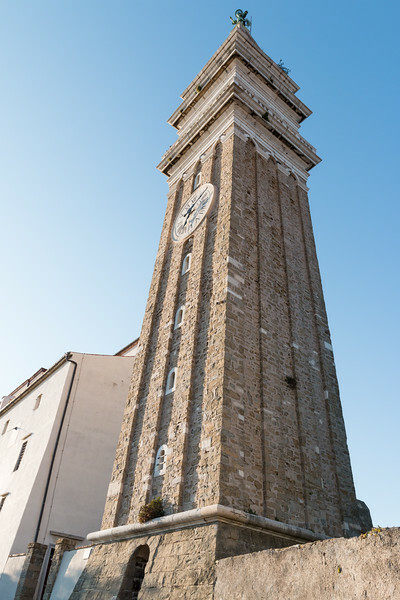 At 46 m high, the tower is a smaller version of the San Marco Campanile in Venice. 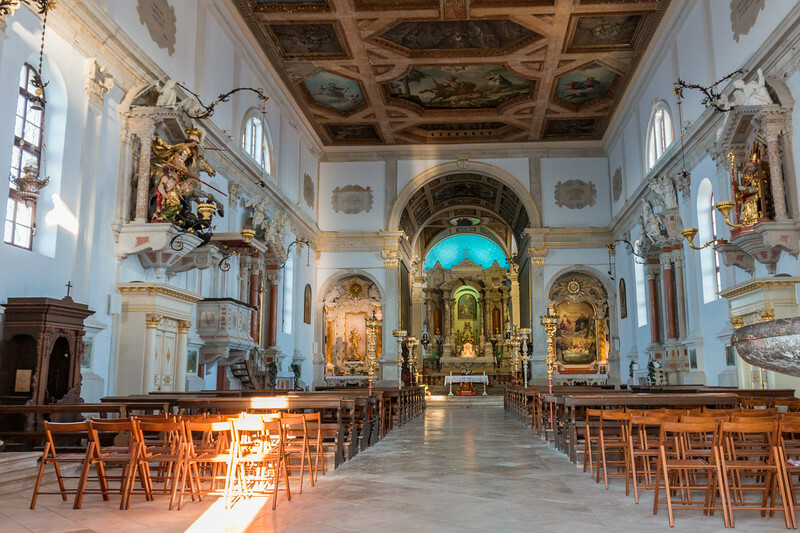 There are also other small churches throughout Piran and we stumbled upon quite a few that are worth peeking in. 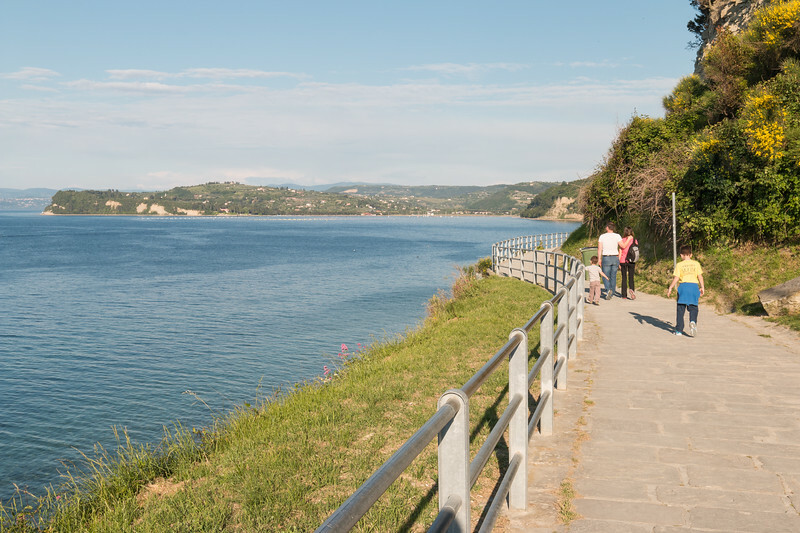 There are many walking paths in and around Piran, but the coastal path is a great choice if you want to exercise your legs a little, particularly the stretch that starts very close to St George’s church, right next to the walls, towards Fiesa and beyond. 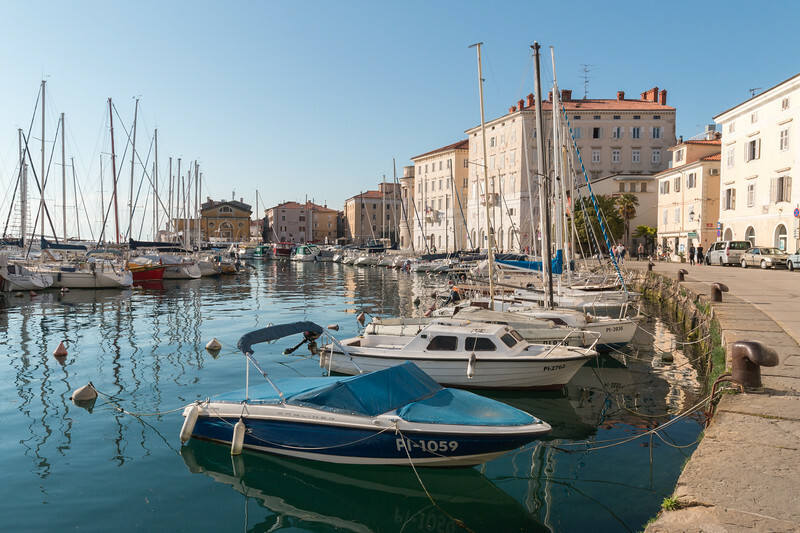 After visiting the highlights of Piran, walking the waterfront is the next best thing to do. Our itinerary, which we suggest you follow, starts at the Cathedral of Saint George and follows the path downwards to the waterfront all the way to the tip of the peninsula, the Punta, where you can find the lighthouse. Return to Tartini Square still along the waterfront and potentially make some detours further into the old town. This route passes through a few restaurants and cafés that are very inviting to sit down and appreciate the location. Once at the Square, you’ll see Piran’s marina once again. We haven’t mentioned it yet but there are a couple of museums here, the Maritime Musem and the Museum of Underwater Activities, plus an Aquarium. Summer is the prime time on the Adriatic coast and the region is quite busy, so you’re better off visiting some other time to avoid crowds. We recommend visiting in the shoulder months – May and September. We visited in May and it was very calm and the weather really good, even though further inland it wasn’t as pleasant. Having had been in the region also in September, we think it’s equally a great time to explore. We visited Piran while on a road trip in Slovenia and therefore used our rental to get there. This is probably the most popular way to reach Piran and although the old town is mostly car-free (mainly for residents), there are big car parks just at the entrance of town and a shuttle bus that links to the old town. If you decide to walk, it takes no more than 10/15 minutes. The other option is to take the bus and there are a few routes available, including not only the nearby coastal towns but also Ljubljana, the Slovenian capital. Despite being a small town, Piran is very touristy and has quite a few accommodation and food options for all budgets. When it comes to picking a place to stay, we always go for something that’s comfortable and budget to mid-range. Piran was no exception and we opted for B&B Miracolo di Mare, a lovely place in a quiet part of the old town which offers good rooms plus an excellent breakfast on the back garden. Our pick for dinner was Gostilna Pri Mari and we couldn’t be happier with our choice – the food was delicious. The restaurant is quite small and we were lucky to get a table, so book in advance if you want to go there. Are you planning a trip to Slovenia? 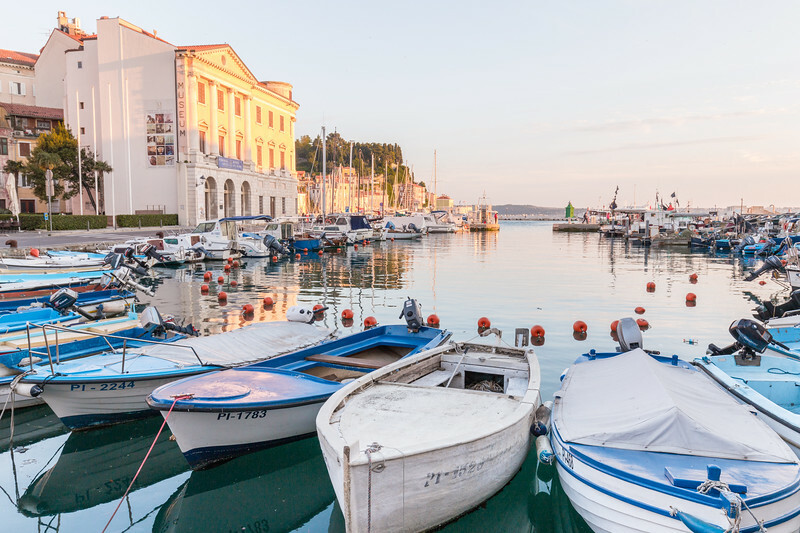 Convinced to visit Piran? Let us know in the comments! Wow, Piran wasn’t on our radar until now. I really want to go! What a beautiful under the radar city. I love the architecture and it’s right on the water. I love the photo you took of Piran at sunset! Great shots, looks like you enjoyed it as much as we did when we visited! It was actually rainy when we arrived, but looks like you got much luckier with the weather. 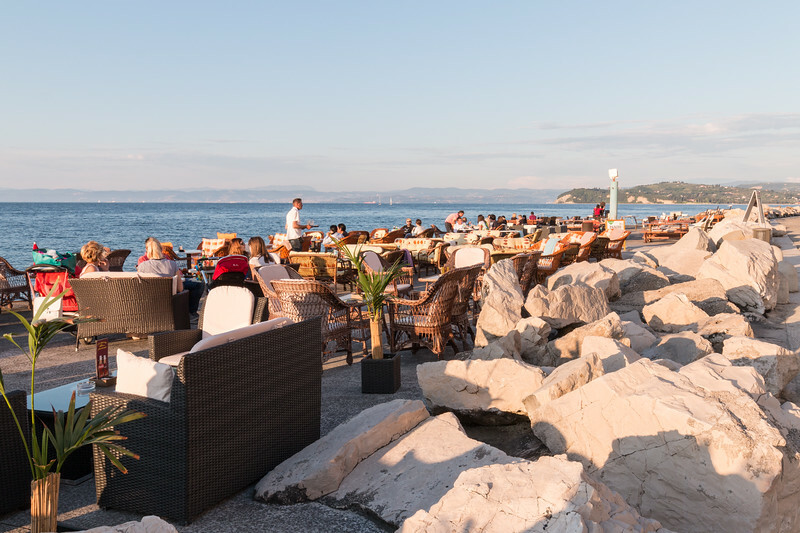 Did you make it over to Portoroz? I have never heard of Piran before. What a hidden gem. Such a picturesque town it is added on my list now. The photo from Piran from above is incredible. Well done. Looks like a really cool town–I’ve been wanting to make my way to Slovenia, so I will have to add Piran to our list of cities to visit! Tartini square is beautiful and I love the photo of the town at sunset! The walk by the waterfront looks like a great idea, too! I have heard wonderful things about Slovenia and would love to visit. We currently live in Northern Italy so are so close it really gives us no excuse not to travel there at some point. I can’t believe how similar the Bell Tower looks to the one in Venice, it is easy to see the influence that Italy has clearly had on the area. I love stunning views from above also. Great read! Thanks for all these tips. Since I will go on a roadtrip through Slovenia this August I’m more than happy to read everything about it! Can’t wait to visit Eastern Europe and Slovenia in particular. Piran looks like an amazing place to explore. The water front looks fantastic for running and biking. Love the gorgeous blue skies. Definitively taking your recommendation to visit in May. Great pictures, would really love to visit now!!! 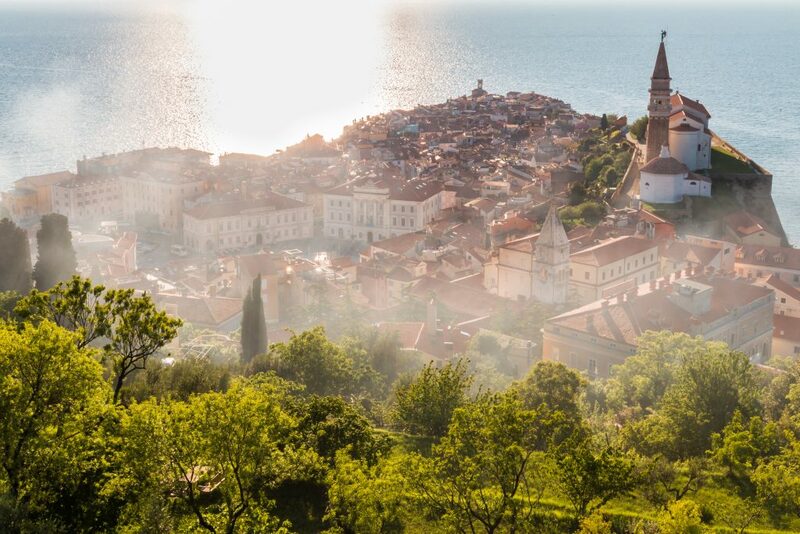 I have heard lots of wonderful things about Piran – it looks like a beautiful destination in Slovenia. The views from the old city walls are stunning. You can really see the Venetian influence in Piran … I’ll definitely consider paying this place a visit in my upcoming tour of Europe!